When you go to visit your eye doctor, you want to know that OCT technology the optometry office has the most up to date and advanced technology to diagnose eye disease, and screen for vision problems. At Wink Eyecare Boutique we use the most advanced technology in all of of our eye exams and eye care services. Read about the different technologies we use during your complete eye exam. 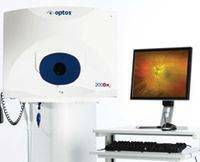 Introducing new OPTOS Optomap technology! This amazing scan allows physicians to see retinal, optic nerve and cornea structures that are invisible using traditional exam methods. The Optomap scan enables us to see minute changes in the eye, thus diagnosing eye disease earlier than ever before, and preventing vision loss. Read more about this amazing technology, including an interview with Dr. Cohn. Sight, after all, is the most precious of all the senses. And we intend to keep it that way. Call 301-545-1111 for an appointment or book online today! The eye exam begins with our Marco Autorefractor. Our autorefractor takesan objective reading of a patient’s prescription by measuring the sphere,cylinder, axis, pupillary distance, interocular pressure, and corneacurvature of each eye. Every crucial measurement measurements for anaccurate prescription is calculated within minutes from the touch of abutton. Patients enjoy the comfort, immediacy, and effective resultsprovided by an autorefractor. Plus, the Marco stores all informationrecorded into a data card, so we can access all information relevant to any patient at any time. Routine eye exams differ from place to place, but Wink Eyecare Boutique provides the most comprehensive eye care that utilizes the latest technology - the iWellness Exam.